pocket on dress with letter "G"
Does your toddler run around the house mumbling giberish? Do they laugh hysterically at the littlest thing? Are they constantly getting into mischief when you aren’t looking? If any of these sound like your child, then they may just be a Minion after all! Toddlers and minions have a lot of things in common, actually. They both speak gibberish, they are unpredictable at times, and they are all around fun-loving beings. 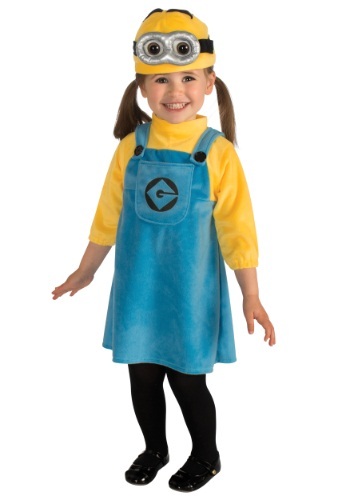 So why not pick up this Toddler Girls Minion Costume for your little one? This is a complete costume that even comes with the tights. Oh, just make sure your toddler doesn't get into too much mischief as a little minion! Though, we’ve already established that they probably will get into a little trouble no matter what you do! This officially licensed toddler Minion costume from the Despicable Me movies comes with everything you need to give your toddler a fun and charming look for Halloween. The costume starts with a yellow long-sleeve dress that has an attached blue overall dress that gives your child that classic Minion look. The pocket on the dress has a letter “G” for added detail. The Minion character hat has attached goggles and eyeballs - after all, your child can’t work in the lab without them! A pair of black tights are also included to give your child a Halloween-ready look right out of the box! Team up with other little Minions for a fun group costume this Halloween!